In Guadeloupe, women rule the restaurant industry, and they have their own idea of what a court-bouillon should be, said Maricel Presilla in Peppers of the Americas (Lorena Jones Books). Yes, the island has been a French territory since 1674, and a refined French culinary sensibility “suffuses even the most traditional dishes.” But Guadeloupeans long ago fell in love with a Scotch bonnet pepper, called piment, that adds “biting heat” to the recipe below. In France, “court-bouillon” means a quick broth made for poaching fish or poultry. 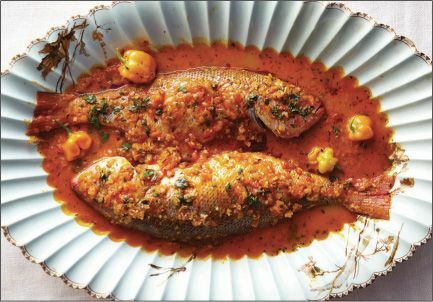 In Guadeloupe, the phrase refers to any seafood seasoned in a citrusy marinade and cooked in a garlicky tomato sauce colored by achiote. This version, from Madame Jeanne Carmelite of La Nouvelle Table Créole, comes with a tangy table sauce. Serve the dish with red beans and rice, accompanied by a dry Sancerre or a Malbec rosé. In a small bowl, combine 1 minced pepper, juice of 1 lime, 3 mashed garlic cloves, and 1 tsp salt. Rub fish fillets with marinade, cover plate or container tightly with plastic wrap, and let sit in refrigerator for 30 minutes to no more than 2 hours. Prepare achiote oil: Place achiote seeds and ¼ cup extra-virgin olive oil in a small saucepan and warm over medium heat until oil turns orangered. Set aside to cool, then strain. While oil cools, make table sauce: In a small bowl, stir together 2 mashed garlic gloves, the juice of the remaining lime, 1 minced pepper, parsley, 2 to 3 tbsp extra-virgin olive oil, and ½ tsp salt. Set aside.